Translation Tribulations: How would you translate the chart in this DOCX file? How would you translate the chart in this DOCX file? Can anyone tell me quickly the best way to translate the chart in this DOCX file? 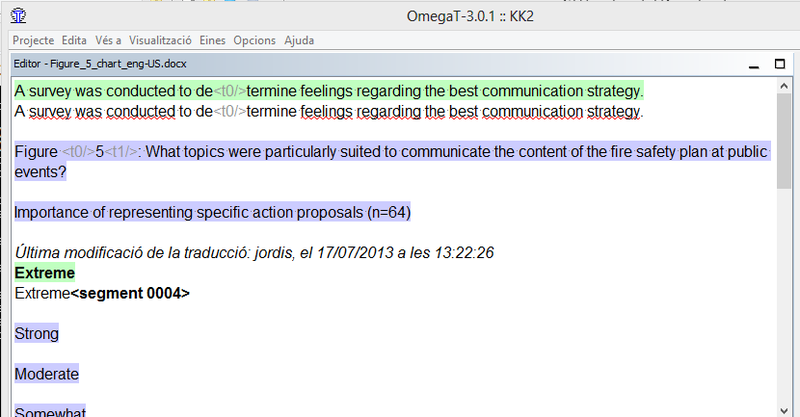 Or how to get an accurate word count of the words to be translated in the file? I love to see the different approaches people take to this problem. It's one which I think is encountered with some frequency by translators, and in the past I too many different approaches to it - long ago I usually did something involving PDF conversion, editing of the PDF and making a screenshot. But that is inefficient and doesn't allow the use of CAT tools. The thing about OmegaT is that it's sort of geeky - the solution looks pretty good here, but I can't actually make it work myself. The solution I worked out last night is very similar to the one described by Stanislas in the comments. 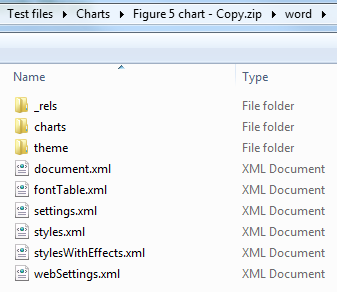 Look inside the ZIP file with Windows Explorer or another suitable tool as described in other blog posts. 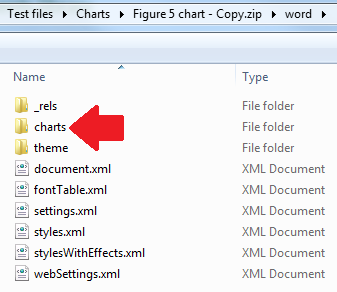 Inside the "word" subfolder there is a folder named "charts". It contains XML data with all the chart headings, numbers and labels. Copy it. When the translations are completed, paste the XML files back inside the charts folder in the file structure. Rename the extension back to what it was at the start (DOCX in this case). You're done. No refresh necessary (unlike with embedded Excel or PowerPoint objects). 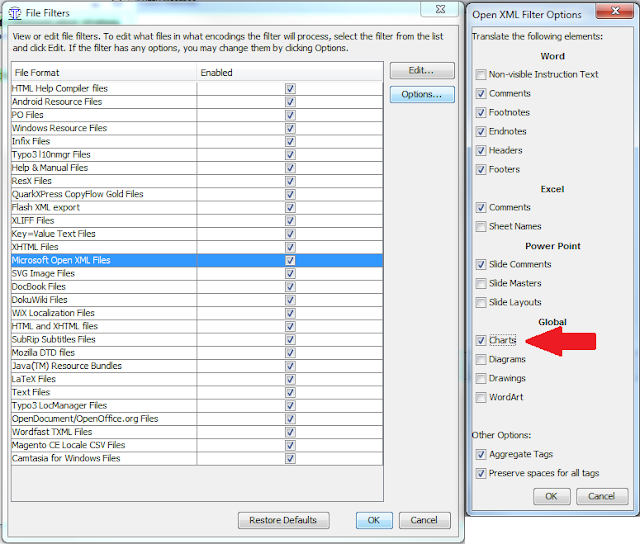 A memoQ filter configuration for these XML files can now be found on Kilgray's Language Terminal. The text in the figure is on another computer (in a .xlsx file). Would it be possible that your CAT tool would import this text too if it could find it? If you had this file you could do change source in File | Info | Edit Links to Files | Change Source. You might also be able to break the link, and then manually create the missing .xlsx file and re-link it? Just guessing really. PS: I count 65 words using ABBYY Screenshot Reader. ABBYY Screenshot Reader? Good idea. That number sounds about right. The much-favored PractiCount that everyone depends on so much told me 17 words. Even Microsoft can do better than that. 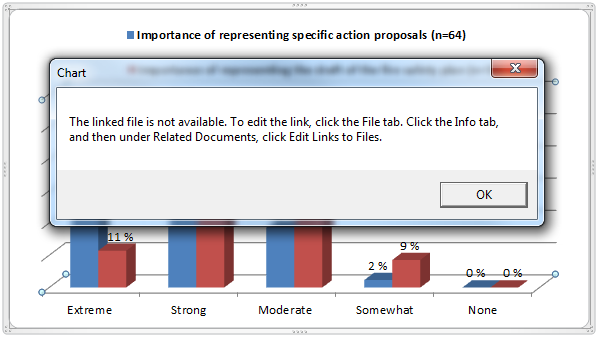 Sometimes LibreOffice gets it (after breaking the chart or Excel file up), but not here. You may print it as PDF and open it with a suitable PDF reader (PDF X-Change Viewer did and does a brilliant job here, while others did not get it), copy all text and paste it into a Word file to count it. This sounds complicated, but may be the faster solutions for huge files. This way works only for word counting, as layout screws up and words get shortened (!) and separated by tabs. I count 74 words, including numbers. Hi! This is how I managed to edit the chart text. However I don't know how the file will react when the Excel file becomes accessible again (It might synchronize and the text elements of the chart might revert to their original values). 3. There is a file there named "chart1.xml"
5. After all the text elements have been replaced, I closed WinRar, and it prompted me to update the file in the archive. I selected "Yes". 6. Finally, I renamed the file to .docx and it opeped correctly with my updated text. It works on my computer, I don't know if this will work for you but that may be worth the try! Subject: Could you tell me how to get an accurate word count from the attached file? I was hoping that AnyCount would catch the words in the figure as well. I managed a correct count using ABBY Screenshot Reader, and was wondering why AnyCount didn't use OCR on the image portion... Is there a setting to make it do this? Unfortunately, there is no possibility to count text in the chart. The only way to do that is to make a printscreen of this chart and to remove all the diagrams and lines leaving only the text. Thereafter you will be able to count the text from the printscreen you have got. 1. I was under the impression that AnyCount could use OCR to count words in images. Why can't it figure out that there is text there that it can't get at and apply OCR? 2. The text in question is actually present inside the file. Please have a look at Kevin Lossner's blog post on this exact problem (http://www.translationtribulations.com/2013/07/how-would-you-translate-chart-in-this.html) and how to get at it. Couldn't this be programmed into AnyCount? 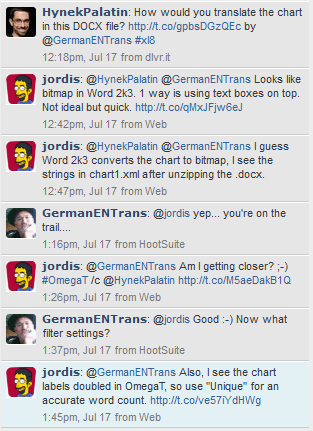 It's just a matter of renaming the .docx as a zip file and locating the text displayed in the charts. AnyCount may recognize the pictures like a text. Because of this it may give you false results. I would like to mention that AnyCount uses its own OCR with its own abilities. A survey was conducted to determine feelings regarding the best communication strategy. Figure 5: What topics were particularly suited to communicate the content of the fire safety plan at public events? It seems that incessant complaining might actually work. After some back and forth between me and the AnyCount (AIT) support guy (in which I politely reminded him that AnyCount is not cheap (at €85 for the Enterprise edition) and really should be able to do this if it is going to offer us translators any added value), I received the email below. Your suggestion has been reviewed by our lead software developer and entered into our corporate suggestion database. We will consider your suggestion while working on upcoming versions of AnyCount. Do not hesitate to contact us if you have any other questions or suggestions.